In commercial kitchen or catering unit, there can be three different types of sink and faucet stations. These include sinks for hand washing, dish cleaning (pot wash), and food preparation. 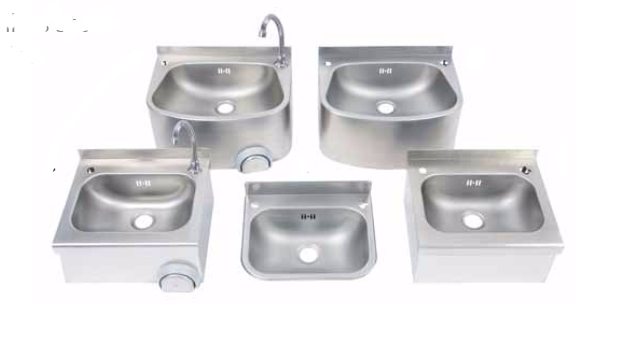 Based on food service guidelines, each of these types of sink must exist in separate areas of the kitchen and must be used precisely how they are designated. This guide, will help caterers to understand the world of 304 stainless steel catering sink bowls. These bowls can be used in any of the above mentioned ways, as long as you use them according to industry and governmental standards. If you are unsure about the sink top or bowls you require, please contact us before placing your order. 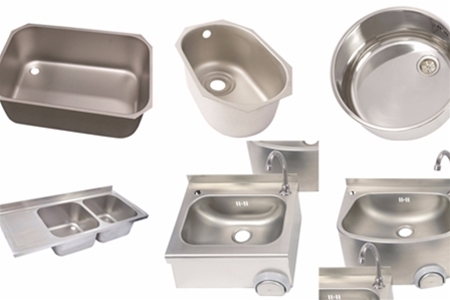 Inset catering sink bowls are typically used for food preparation and hand washing. These types are typically inset into a stainless steel surface, but aren’t typically welded there. Sometimes the sink bowl is comprised of the single sheet of 304 stainless steel that makes up the working surface. With many forms of stainless steel, attempting to weld the material causes what’s called intergranular corrosion, meaning that after heat is applied, the metal is actually weakened. Since this material is so resistant to corrosion, it is perfectly amenable to welding. Weld in sink bowls of this material are easily welded into place and stay strong for years; if not decades. 304 stainless steel can achieve a very reflective polish and some commercial kitchens prefer this look. Typically, each bowl is only shiny looking on its inside surface, as the outside surface is usually treated with an latex paint-like substance that will actually muffle sound from inside the bowl. Descaled stainless steel bowls are a more matte option for catering kitchens. Creating stainless steel bowls of this type typically takes a process of machining, which reduces the natural sheen of the 304 stainless steel. Weld in Sink Bowls are available in Descaled and Polished finishes. Click on the Part Number to the applicable product page. Please specify right hand or left hand sink when ordering. Die-Pat round weld in, inset sink bowl kits with polished finished in a variety if diameters and depths. Advantages of wall mounted wash hand basins is that these units are fully spot welded including apron to save installation time on site. Knee operated mixing valve, single inlet spout and hoses. A soap dispenser can be fitted or a stainless steel blanking plate supplied. The wall mounted unit is fitted on the wall by keyhole slots on the back and comes complete with combined overflow waste kit. Die-Pat commercial kitchen sink tops available in single bowl, double bowl versions with single drainer or double drainer. 304 Stainless Steel: What Makes it Unique? To understand what makes these sinks so perfect for a commercial grade kitchen, let’s take a look at the material they are made of. 304 stainless steel is a great, food prep-ready material that is rust resistant and easy to clean. A2 is also another name for 304. This stainless steel has become rather common in food preparation because of its unique composition. This type of stainless steel, like most steels, is an alloy. The metals used to make 304 are iron, chromium, and nickel. Since it is an austenite steel, this material is perfect for kitchens, since the metal won’t conduct heat very easily, is non-magnetic, and is also resistant to conducting electricity. On top of all of this, this material is very resistant to corrosion and is easy to shape for various uses. As mentioned before, sink bowls, according to federal and state guidelines, must be used in three distinct ways in a commercial kitchen. Let’s take a more in-depth look at some uses and features in this next section. Sinks that use this type of sink bowl don’t tend to have as many regulatory requirements as the other two types. 304 catering sink bowls of this type can either be situated with a single compartment or a double. Drainage for this type is typically aligned along the opposite corner from where the food is being prepared and many catering establishments tend to use both descaled and polished types. Dish washing sinks are required by law to have three compartments; one is established for washing the dishes, the second is assigned exclusively for rinsing the washed dishes, and the third sink bowl is relegated to the sanitization of the dishes. Since water can easily cause the load in these types of sink bowls to exceed half a ton, it’s best to seek out a sink bowl that has 304 stainless steel with a 14 through 16 gauge level of thickness to prevent problems down the line. Hand washing sinks are required by law to be positioned every 20 feet or so, so how many sink bowls you’ll need for your kitchen will vary greatly based on your kitchen’s size. Fortunately, these types of sinks don’t have to be massive; even in a large kitchen, so you can save a bit of money in buying a few inset-type sink bowls for hand washing. Despite being largely corrosion resistant, without proper maintenance, your new sink bowl can corrode over time. Without proper care, surface deposits will form; even on the sections that you tend to not use directly during the food prep process. If you ignore these sections, the resulting corrosion can and will spread to the more widely used areas; ensuring that you’ll have a ruined sink. In addition to the deposits that naturally form from salt in the air, bits of iron from silverware and industrial chemicals can also lead to corrosion of your stainless steel bowl sink. Fortunately, it’s very easy to prevent this gradual damage. First, while many caterers like to use bleach to clean their surfaces, this is a bad idea on 304 stainless steel. Bleach can cause surface pitting on stainless steel; which will result in vulnerabilities within the makeup of your bowl sink where corrosion can take hold. For the best cleaning, simply wash the surface of the sink with water and mild soap. When finished, just rinse off with water, and polish the surface of the bowl sink with a dry cloth. Never use harsh materials like steel wool or scouring pads when cleaning, as these can cause microabrasions that weaken the sink and can lead to corrosion. A well kept bowl sink will keep your catering business operating for years, if not decades. The 304 stainless steel that they are constructed of is lightweight, amazingly strong, and tends to repel much of the damage that would make other types of sinks useless after a few years. Just remember, as your catering business grows, you’ll need more bowls, so be sure to pick ones that fit each of the needs that we’ve covered in this guide and your kitchen will run like a well oiled machine.